My dining room is missing something, feeling incomplete. 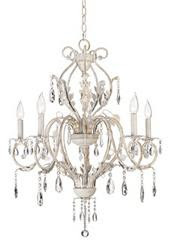 I have been looking at pendant lights and chandeliers, thinking that might be what it needs. I haven't found anything yet. The crystal ones I've seen are a bit too fussy and too expensive. The black iron ones are too heavy looking. 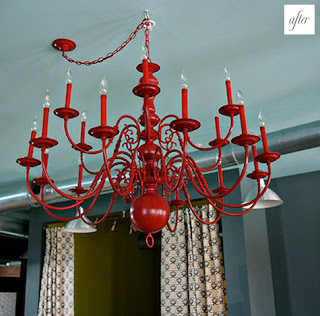 I saw this red one (designspongeonline) that someone painted, it used to be an old dated brass fixture. Got me thinking that I could find a deal on an old ugly one and paint it pewter or espresso, so I'll be scouring my favorite thrift and consignment stores. Wish me luck!